There are two common species of vulture in Tennessee; the Black Vulture and the Turkey Vulture. The Black Vulture is more gregarious and easily distinguished in flight by its flatter flight profile, more frequent and rapid flapping, and large white patches at the tips of the wings. They feed almost exclusively on carrion, such as road-killed animals, and spend much of the day in flight searching for carcasses. At night they form large communal roosts, often with Turkey Vultures. Black Vultures are non-migratory and breed in eastern North America from southern New York, throughout the southeast, and into all of Central and South America. Description: This large black soaring bird has broad wings held nearly flat in flight. Wings have large white patches at tips, the tail is short and square, and the feet extend to edge of tail. Frequently flaps while soaring. Head is dark gray, unfeathered, and wrinkled. Legs are pale gray. Sexes are similar. Turkey Vulture has silvery feathers along the trailing half of the wing. They hold their wings in a "V" when soaring, flap slowly and infrequently, and appear to wobble or teeter-totter back and forth. The wings and tail are longer, the head (in adults) is red. Habitat: Nest and roost sites are most often in dense woodlands, but birds generally forage in open habitats. Large roosts often form on communications towers. A lower food supply and available nesting sites may explain why they are less common in agricultural West Tennessee. Diet: Carrion, preferring large carcasses over small ones in open areas. Infrequently kills live animals, such as nestling herons, and rarely, newborn calves and baby turtles. Adults feed nestlings regurgitated flesh. Nesting and reproduction: Black Vultures are monogamous and maintain long-term pair bonds. They begin perching near nest sites in early to mid-February with egg laying from late February through late May, peaking in March. Incubation: Both parents incubate for 37 to 48 days. Fledging: Young first wander from the nest site after 2 months and begin to fly at 2.5 months. Fledglings may be fed by their parents for up to 8 months. Nest: The nest us typically in a dark recess such as a cave, hollow tree, under rock ledge, deer stand, or abandoned building. No nest structure is built. Pairs will continue to use a nest site for many years as long as breeding is successful. 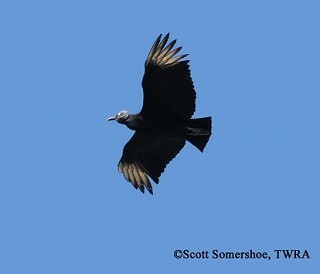 Status in Tennessee: The Black Vulture is a fairly common permanent resident at low elevations across Tennessee. In winter somewhat more common in Middle and West Tennessee, than East Tennessee. Winter roosts can consist of more than 100 individuals. Breeding Bird Survey data show a great increase in population in Tennessee over the last 20 years. Unlike Turkey Vultures, Black Vultures lack a highly developed sense of smell and so cannot find carrion by scent alone. However, they exploit the superior food-finding skills of Turkey Vultures by following them to carcasses and then displacing them from the food. A lone bird is no match for the slightly larger Turkey Vulture. But they are commonly found in flocks, which can easily drive away the more solitary Turkey Vulture. Both Black and Turkey Vultures practice "urohydrosis", which is the practice of squirting liquid excrement onto their legs, which cools the legs when the liquid evaporates. Both Black and Turkey Vultures have naked heads and necks, which prevents feathers from becoming fouled when they stick them into rotting carcasses. Cathartid vultures can rapidly ingest large quantities of food and then go several days without eating. Best places to see in Tennessee: Black Vulture can be found statewide, year round. They are often seen roosting on communication towers or feeding on road-killed animals on the side of the road.